Sitting before your Mac computer with a video file unplayable due to the format compatibility? Tried to convert videos from one format to another that recognizable by Mac computer, say, Mac mini, Mac Pro, iMac? If you are new to Mac OS, you may feel lost in the seas of 3rd party video converters for Mac. Don't worry! This article will be a brief guide to help you convert videos on Mac. When we talk about Mac (or Macintosh), usually we mean personal computers marketed by Apple Inc., which includes Mac mini, Mac Pro, iMac desktops, and MacBook Pro and MacBook Air laptops. All Mac computers run on a certain Mac OS, such as Mac OS X series after 2000: Tiger/Snow Leopard/Mountain LionMavericks/Yosemite/El Capitan/macOS Sierra. A Mac video converter should be a tool working perfectly on Mac and Mac OS. What is the Best Video Converter for Mac mini/Mac Pro/iMac? There are many video converters available for converting videos on Mac. If you just need one to convert between videos files, the free software HandBrake will suit you well. It is an open-sourced multiplatform video converter. It is well-polished and full-featured to meet most common video audio converting needs for Mac users. But if you have more advanced requirements in converting videos for Mac mini/Mac Pro/iMac, such as converting videos to iPad, iPhone, iPod, Android, WP8, customizing video audio parameters for specific uses, and converting HD camcorder videos, etc., a professional Mac video converter WinX HD Video Converter for Mac may be the best choice. WinX HD Video Converter for Mac is all-in-one video converter for Mac mini/Mac Pro/iMac. It is able to help Mac users convert HD videos like AVCHD, H.264/MPEG-4 AVC, MPEG2 HD, Quick Time HD Video, HDTV Video and Blu-ray videos to other video formats for playback or further editing. For example, this Mac video converter enables users to play HD videos on the latest iPad mini, iPad mini 4, iPad Pro/Air, iPhone 7, Samsung Galaxy, Surface Tab, WP8 phones, and so on. How to Convert Videos on Mac with the Best Video Converter for Mac mini/Mac Pro/iMac? To get started, you need to free download and install WinX HD Video Converter for Mac on your Mac mini/Mac Pro/iMac. Step 1: Run this Mac video converter and load source videos by clicking "Add File". To convert YouTube online videos, just click "You Tube" button on the top. 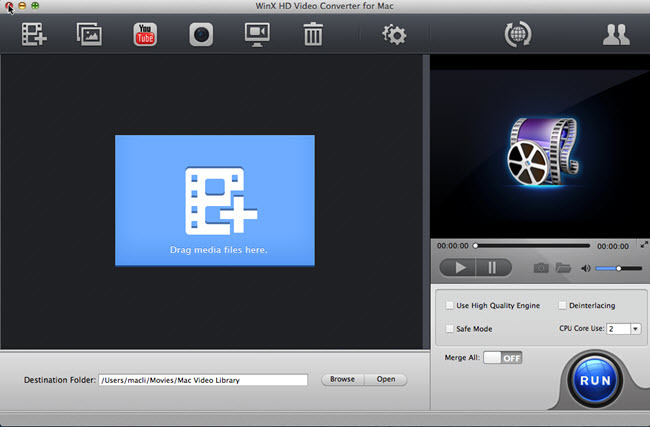 Tips: WinX HD Video Converter for Mac allows you to drag and drop to load sources. Step 2: Select output format/device. It can convert videos to MP4, MPEG, WMV, MOV, Apple iPhone iPad iPod, Android, Nokia, Sony and more. By choosing a device as target, you can simply select one profile from the preset Profile Setting list. What's more, if you are familiar with video audio codes, you are also allowed to modify the parameters according to your needs. Step 3: Select an Output Folder to store the converted videos on Mac. Step 4: "RUN" converting videos for Mac mini/Mac Pro/iMac. WinX HD Video Converter for Mac will bring you easy and fast video converting experience on Mac computer. 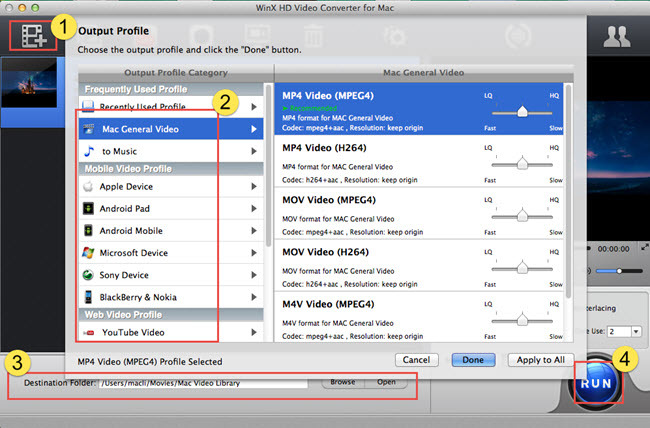 Now you can download WinX HD Video Converter for Mac and give it a try.